BRUSSELS, BELGIUM – Wabco Holdings is investing $10 million into Nikola Motor Company – a business in Salt Lake City, Utah, that plans to produce hydrogen-electric trucks. In addition to the cash infusion, the two companies have signed an agreement to accelerate the development of safety technologies that are optimized for electric commercial vehicles — like Electronic Braking Systems, traction and stability controls. 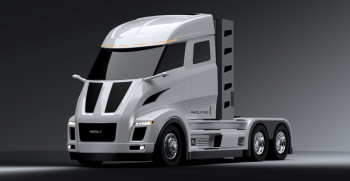 “We have added a world-class supplier to the Nikola truck family and are looking forward to our collaboration to bring Nikola’s zero-emission trucks to market,” said Trevor Milton, Nikola founder and Chief Executive Officer. Nikola plans to begin testing its zero emission trucks with commercial vehicle fleets in late 2018, with full production to begin in 2021. “As vehicles become increasingly autonomous, electric and connected, Wabco continues to be at the forefront of breakthrough technology innovation,” said Jacques Esculier, Wabco chairman and Chief Executive Officer.